If we speak about large organizations with hundreds of employees, searching individual mailboxes can be cumbersome and vastly inefficient. The feature that enables perfoming a multi-mailbox search on an Exchange server is called eDiscovery, and it enables access all messaging records stored in an organization on premise or online. However, the built-in Exchange tool has a couple of drawbacks. The thing is, it was only introduced on Exchange Server 2007 – and left much to be desired. In 2010 and 2013, eDiscovery underwent some considerable improvements, but there is still one irregularity which is quite hard to fix: in mixed environments multi-mailbox search is virtually impossible due to low compatibility of different eDiscovery editions. That is to say, if you run a combination of Exchange Server 2007 and 2010, or 2010 and 2013, or three versions of the platform at the same time, finding a message that can be on any of your servers through a standard multi-mailbox search query might not prove efficient. Moreover, companies that still use Exchange 2003 along with later versions cannot perform search on their 2003 servers. Is there a truly efficient search tool for all possible types of mixed Exchange environments? Our answer to this question is definite ‘yes’. The lookup tool you can rely on is called MAPILab Search for Exchange, a solution enabling multi-mailbox search throughout any combination of Exchange servers, from 2003 to 2013, including Microsoft Small Business Server 2011. The product is both easy-to-use and powerful due to enhanced flexibility of search queries and a concise deployment procedure. Below you will find a brief overview of its principal advantages, features, and elements of the interface. MAPILab Search for Exchange is a separate product that is launched directly from the list of applications after installation on any workstation in the domain. Its home screen displays the current state of deployment, and you can access all the relevant options with just a click. If you are not sure where to begin, you can choose one of the wizards under Actions on the right: Initial Setup, Content Access, or Content Indexing. Keep in mind that wizards are not only indispensable for novices, but can also be used in the course of troubleshooting, should there be any errors or irregular behavior. For instance, the Initial Setup Wizard includes such steps as setting your preferred results folder, your domain controller settings, and basic search filters, that is, which mailboxes and mailbox databases you would like to search. As we move on to search queries, which constitute the core logical unit of the application, we can see that the Query Wizard is also designed to make the most of each lookup session with the help of an array of flexible search parameters. You can look for key words in items of a certain type or in certain folders, you can choose the timeframe for your search or indicate senders and recipients. 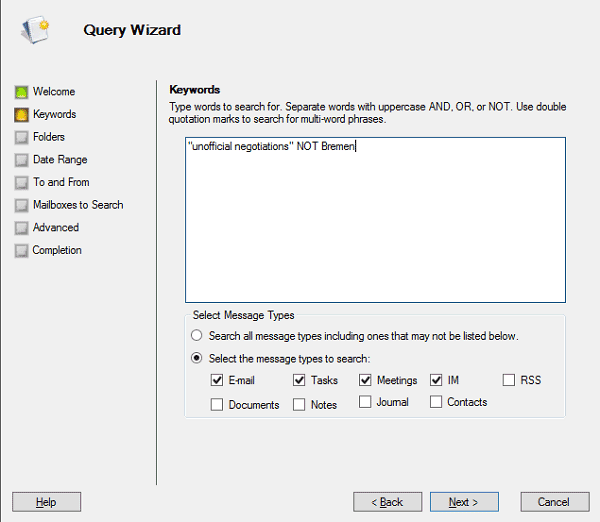 Naturally, you can narrow your search to as many mailboxes as you need, even if you have not done so in the Initial Setup Wizard. And finally, you can also opt for a search method – Deep or Flat – in order to decrease search time. Besides, it should be noted that the wide variety of options does not make the wizard superfluous for simple search, because the default settings are well suited for basic tasks. And last but not least, let us dwell on search results options available in the tool. After the query has been processed, you will be able to perform quick search across the retrieved data, group and mark your results and choose between two forms of export: either as message file sets (.eml or .msg), or as a single printable .mht file. What is more, all the running tasks are visible and you can manage them in real time, shifting priority and detecting possible faults. Thus, MAPILab Search for Exchange is equally suitable for emergency incidents and for routine monitoring, giving you adequate control over your corporate Exchange servers regardless of their platform versions.